I have mentioned many times how fortunate I am to have a "village" that sews for my darling grandchildren. Let me tell you about a bright star in that village. This is a picture of my friend Barb. Barb was a lady in every sense of the word. You wouldn't find a kinder, more generous, smarter or more talented woman. She never hesitated to share with those she met and her stitching skills were over the moon spectacular. I met Barb through SAGA and an online sewing forum. She even traveled to attend workshops at my local chapter. And she gave great hugs! Everyone who met her, loved her in an instant. Sadly, Barb died last year. She has been missed so much in our small, tight knit group of heirloom sewists and smockers. I can't count the number of times she is mentioned and remembered. A friend just mentioned her on Monday after seeing a Wee Care Gown that Barb had donated to the traveling SAGA Wee Care Trunk Show. My friend's chapter was hosting the trunk show and once again, Barb was there to inspire through the needlework she left behind. Anyone who knew Barb knew she had a shining star in her life, her husband Robert. She never missed a chance to sing his praises. They were devoted to one another. He supported her in so many ways and understood what her artistic endeavors meant to her. In short, he loved her beyond measure. Our hearts have been full of thoughts and prayers for Robert as he grieved his bride of almost 48 years. Robert has kept up with her email account and her online membership of that sewing forum. Every now and then he pops in to let us know how he is doing and gives us a chance to say hello. Imagine my surprise back during the winter when in my inbox was an email from Barb! My breath caught in my throat and I was almost afraid to open it. I am so glad I did. It was a wonderful surprise from Robert. Through the forum and my blog he had heard that we had a new baby boy on the way. He had something he wanted to send the baby. My heart was overflowing. A few years ago on the forum we had done a "Taylor" challenge. Stitchers used the Children's Corner pattern, Taylor as a base for a new creation. This was Barb's. How adorable is that? I was thrilled to find this when I opened the box. 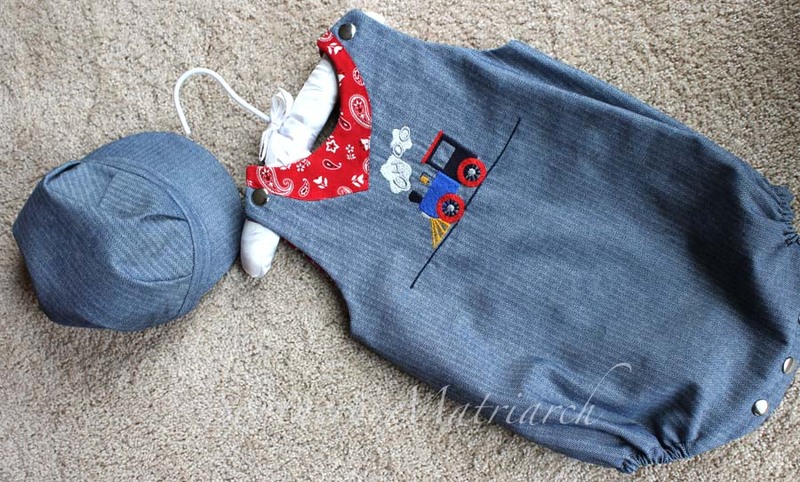 Barb had used a striped denim for this cute bubble, lined with a bandana print. A darling little train is embroidered on the front. 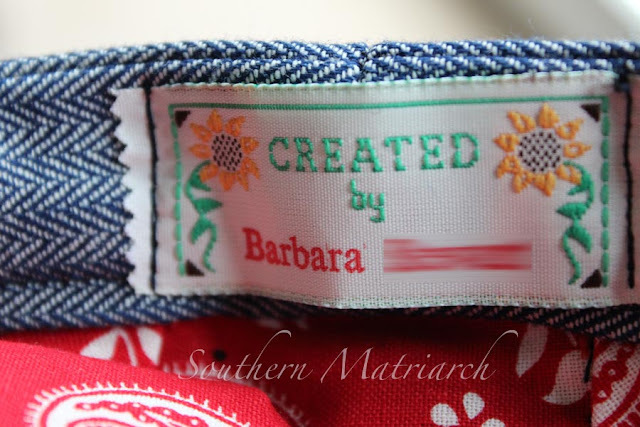 (Barb could make an embroidery machine sit up and yodel.) I love the "kerchief" she pieced on the front. 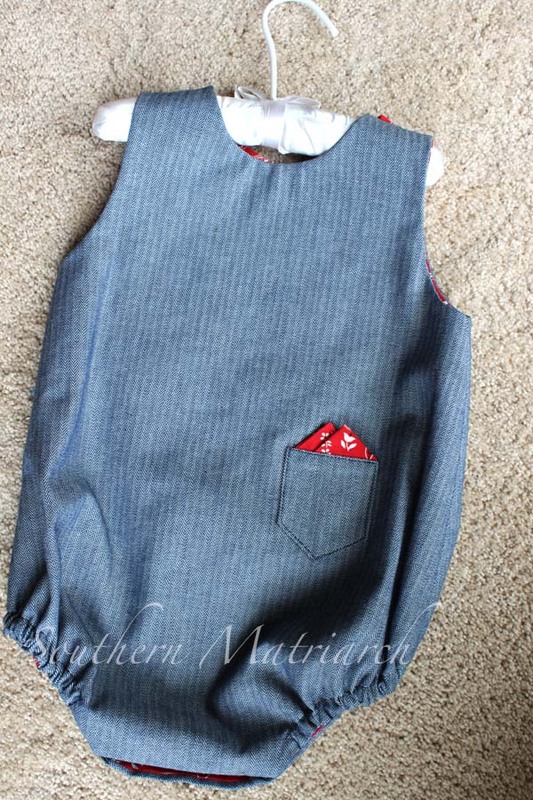 She even stitched a little surprise on the back, a pocket with another kerchief at the ready when needed by a weary little train engineer. I loved it all and my daughter was touched that Robert had thought of her baby and wanted to send along this treasure. Of all the touches she put into this little bubble, what I loved most was the tag she sewed into the cap. I could hardly read it through the tears. Love of friends and a stitching sisterhood lives on. Thank you so much Robert, and thank you Barb for once again touching our lives. Thanks for letting me share my friend Barb with you. And stay tuned, we have another Anniversary giveaway tomorrow. Barb and Robert touched so many of us, and continue to do so. Such a coincidence, because I have been thinking of her so much lately. We used to always discuss our hydrangeas. Mine are currently blooming, and I cannot help but think of our sweet friend. I hope hers are also blooming, and bringing comfort and joy to Robert. I love seeing Barb's cute version of Taylor again. That is so special. I've been thinking about Barbara recently, she and Ray were in hospital at the same time and next weekend is a year since Ray went into cardiac arrest. What a wonderful tribute to Barb! She was a very special lady indeed. The outfit she made is adorable. What a lovely tribute to a lovely lady! She and Robert continue to touch and inspire me. I think of Barb so often. I missed seeing the Taylor challenge. I am so so glad your shared the picture of Barb's incredible creation. What a blessing to be able to see Barb's friendship each time you see your grandson wearing Robert's special gift! What a beautiful gift your friendship with Barbara has been. How lucky you all were for knowing such a remarkable woman. 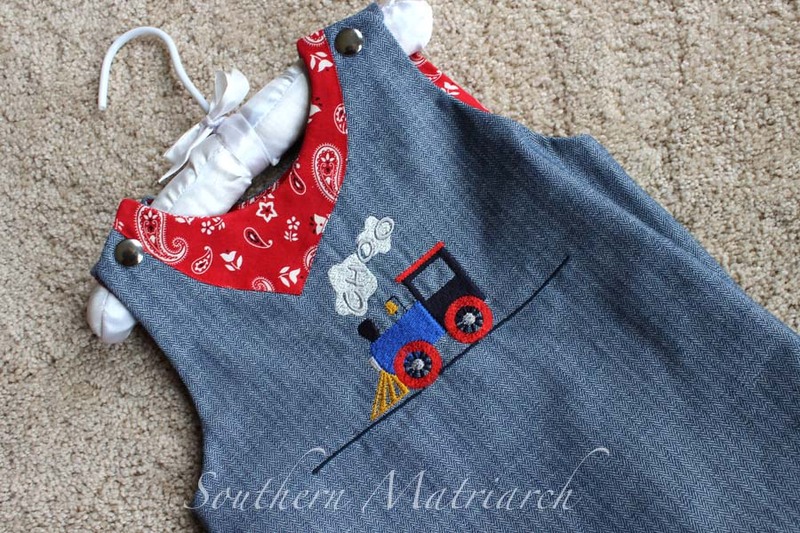 Her little train bubble is precious and sure to look adorable on your new grandson. 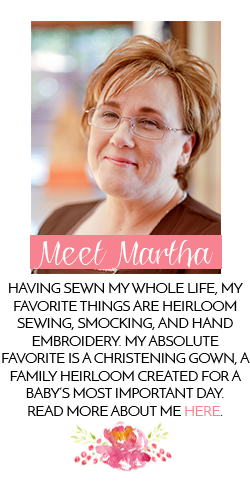 Thanks so much for sharing this with us, Martha. What a kind, special gesture from Barb's Robert! She was such a beautiful lady and still missed so much by all of us. Barbara (and by extension, Robert) was part of our SAGA chapter in NW Arkansas. They drove together to each meeting. Robert was on the computer or read while we had our meeting. They always came over early enough to eat at one of the local restaurants. We loved both of them and felt such a loss when she passed away. She always had a new and perfect creation for us, gave wonderful and detailed programs, and had such great and creative ideas. 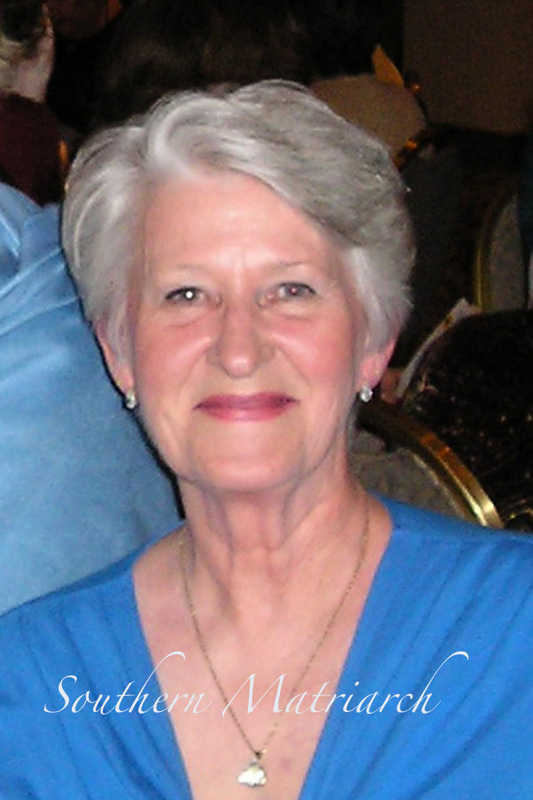 We think of her at every meeting and will always miss her. Thanks for sharing your photos.